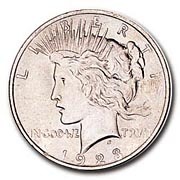 Created in 1921 to mark the end of World War I, the "beginning of peace," the coin is truly an American classic. Incorrectly called the Statue of Liberty dollar by many, it makes a nice set to complete since it ran only until 1935. Again, many saw the melting pot when silver was needed. All coins in about fine to BU condition according to industry standards. Order with confidence. To buy a coin, select your single date, then select the ADD TO CART button. Dates not shown are listed and available below the boxes.